Group Hug is like an uncle that wants to give you a backrub. You know he isn’t doing it for your good. 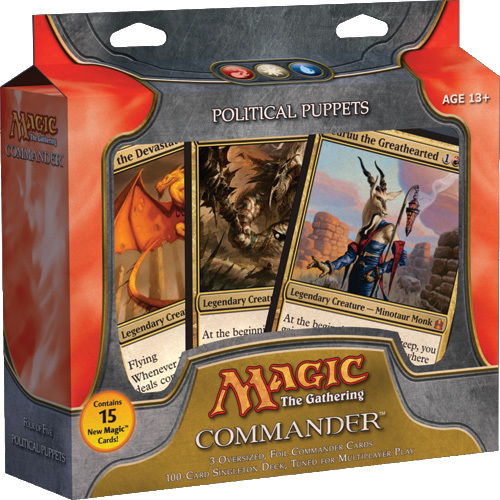 Wizards decided it wanted to include one creepy uncle as part of the Commander precon series, Political Puppets. Political Puppets was a big steaming pile of terrible. If it wasn’t for Fluster Storm and Chaos Warp, these would still be on the shelf. Players would have been willing to just buy the singles online and build around the new legends. Today’s article is for those of you who accidentally bought this precon and want to try and salvage it into something that you don’t feel embarrassed to play. I realize that I am biased in the direction of throwing this heap in the fire and just building a new Commander deck, so I got some help from Uriah over at CMDRdecks. Uriah has the distinction of playing the first Zedruu deck I have ever seen win a game of Commander. Today we will be covering $5, $10, $20, $50 and $100 upgrades to a Zedruu based Political Puppets deck. Hopefully we can save you from the embarrassment of playing the stock list or just give you ideas on how to build your own Zedruu deck. This deck starts off bad. You can argue with me all you like, but you’re better off saving your breath. The easiest part of upgrading this deck is finding space. Running 34 lands in a commander deck with no green color identity, only 2 mana rocks, and a bad curve is just unacceptable. You need to start adding land immediately. Spell selection doesn’t matter much if you can’t cast anything. If we are going to make this deck work, we need to do an overhaul right from the start. Enduring Ideal – Enduring Ideal adds a win condition to Zedruu, which she is sorely missing in the precon. The main way Enduring Ideal wins in this deck is by grabbing Second Chance and Form of the Dragon. With Mistveil Plains, you can recycle the Second Chance and take infinite turns burning people to death with Form of the Dragon. This win condition is difficult to pull off. You will need to get in more than a few games before you get a grip on how to win. Unlike other one spell win conditions, Enduring Ideal doesn’t win immediately. It may be ten minutes after you cast this spell before people realize you have won the game. Celestial Dawn – You need to shut your opponents down so you can survive long enough for your win condition to work. Give this to a non-white player with Zedruu and you shut them down completely. Delusions of Mediocrity – This card is an excellent donate target. Zedruu will be able to draw extra cards since your opponent won’t want this to go away. This is best given to the player you think is most likely to play an enchantment sweeper. You want to make them think twice about destroying all enchantments. Steel Golem/Grid Monitor – Both of these cards are a direct shot to the groin for anyone playing a heavy creature deck. Either of these two cards combine with Dovescape to prevent one player from playing any spells. Give these to an Animar player to watch them cry. Transcendence – Here comes the rope-a-dope. Take swings until it looks like they have you against the ropes. Then, uppercut square in the jaw! Dropped at the right time, you get to see a wonderful deer-in-the-headlights expression from one of your opponents. Zedruu is a bit different from the other 2 deck upgrades I have done. You have an abundance of cheap options. The lists of cards you can include at different value upgrade levels have a large variance. For both Heavenly Inferno and Counterpunch there was a building process from one upgrade to the next. Political Puppets is not a deck that works as well with. The $10 upgrade turns Zedruu into something mean. Zedruu gets more fuel to drive players out of the game. I have never liked the play of giving players do-nothing cards so that you can draw cards and gain life. That plan has you drawing more cards that do nothing. It is much better to have cards in your deck that can cripple an opponent when you donate them. Guile – When you combine Guile with Dovescape, you get infinite birds. Guile is a beater and good blocker by itself. As you upgrade the deck over time, you will add more counterspells. The more counterspells in the deck, the better Guile becomes. Pyromancer’s Swath – This gives access to discard that would otherwise be unavailable in these colors. Pyromancer’s Swath is exceptional at keeping someone in top deck mode. Planar Collapse – Planar Collapse gives you a way to deal with creatures for a very small investment. Thanks to Mistveil Plains, you can make keep playing this with Enduring Ideal. When I played against Uriah, this card is what ended up winning him the game. We couldn’t deal with the constant Wrath of God effect. Thought Lash – Thought Lash is no longer the automatic win it used to be. It still makes a great donate target. The upkeep cost is very frustrating to pay and stops people from casting Vampiric Tutor, or any of the one mana tutors, at the end of your turn. The $20 package gives you resilience that the previous packages didn’t have. By adding in better control and protection we are less prone to losing to some random spot removal and sweepers. Even with added protections and redundancy, you are going to need to play things politically. At heart, Zedruu is a political multiplayer deck. Decree of Silence – Decree gives you protection like nothing else. People literally have to stop what they are doing and start throwing cards away just to get it off the table. When we add Hanna to the mix, you create a prison that lets you delay people long enough to get your epic spells to win the game. Guile and the decree will give you some absurd card advantage. Karmic Justice – Nothing seems to protect your permanents like the vindictive nature of karma combined with other players greed over their permanents I like this even better than Martyr’s Bond. Karmic Justice gives you the choice, not your opponents. Boseiju, Who Shelters All – When your win condition is a spell, your deck becomes a lot better when that spell can’t be countered. The $50 package is the deluxe. When you spend $50, you get to run some real Magic cards. Since the main win condition is Enduring Ideal, you need to be able to find Enduring Ideal. You need to stay alive while you tutor and dig for the spell. $50 gives you the tools you need to accomplish this n a regular basis. Humility – Players are going to have a hard time swinging through Propaganda and Ghostly Prison. You can make the beat down plan even more difficult if you reduce enemy armies to ant token size. Greater Auramancy + Copy Enchantment – Both of these cards are great. Cast Copy Enchantment targeting Greater Auramancy to give all your enchantments shroud. While your opponents struggle with how to deal with this annoyance, you can get busy winning. Wild Research/Mystical Tutor – Earlier packages have a big problem. Those packages can’t find the main win conditions in the deck. You have to rely on drawing cards with Zedruu to find your spells. The deck needed so much improvement that we haven’t had a chance to smooth out the mana base. Fixing a mana base isn’t the most exciting part of deck building, but it is usually the most important. Planar Chaos wedge decks usually will have to have some mana fixing. Since we aren’t playing green, there is almost no reason not to run color fixing lands. There is only a limited amount of basic land search in these colors, so running a greater proportion on nonbasics helps us. Running more dual mana producing lands lets us run one or two more lands that produce colorless mana. Serra’s Sanctum – We run a ridiculous number of enchantments. This card is an obvious inclusion now that we have the budget for it. Gilded Drake – Gilded Drake is one of the best creatures you can run in a Zedruu deck. It lets you trade permanents rather than just donating them. Kor Haven/Mystifying Maze – Even our lands can serve to protect us from our enemies! Mystifying Maze is particularly humorous if someone forgets about it and swings at you with Gilded Drake. Vivid Lands – The vivid cycle works perfectly with the Ravnica bounce lands. Every so often, you want to be able to reset the counters on your vivids. Cheap Duals – There are a large number of lands that tap for two colors that are less than 50 cents apiece. I recommend getting these for your commander decks. They will have drawbacks, but they have the advantage of not costing an arm and a leg. Losing 1 life for mana is not nearly as bad in Commander as it is in a 20 life format. Thank you to Uriah from CMDR decks for helping with this article. Check out his video at the end of this article. I encourage you to head over to GatheringMagic to check out his articles as well as the other Commander content. He produces consistent, quality, commander content on a weekly basis. He is also a great guy, and you should chase him down at any event he plays at and get a few games in. If you need any advice with your decks or just want to chat/play on cockatrice, send me an email to swordstoplow@gmail.com or follow me on twitter @swordstoplow. Until next week, may all your games be fun and all your glasses full.